FlashPoll is a project funded by the EIT Digital. The strategic Business Plan of EIT Digital is to become a leading force in European innovation through integrating and reorganizing the knowledge triangle of education, research, and business (ERB). The Business Plan 2013 of EIT Digital is composed of activities belonging to Action Lines integrating ERB, as well as activities developing and maintaining specific ERB catalysts and offering their services to action lines. 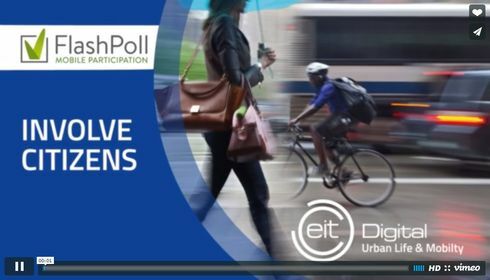 Within the scope of the action line Digital Cities of the Future, the objective of FlashPoll is the development of a location-based and context-aware polling app that provides a direct communication channel between citizens and administrators in order to enable citizen participation in urban planning decisions. Our group focuses on the implementation of a Positioning Enabler and a Context Data Crowdsourcing Platform. The Positioning Enabler provides an efficient background tracking functionality, therefore enables polling the "right/relevant" citizens based on their location with the respect to a poll. Moreover, the Positioning Enabler acts as a mediator bringing Municipalities and citizens together. The Context Data Crowdsourcing Platform, on the other hand, is used to collect and analyze user context. This context data will be semantically interconnected to open datasets, such as the OpenMobileNetwork or Berlin Open Data, in order to exploit the power and richness of open datasets for innovative, sophisticated, and directed flash polls.